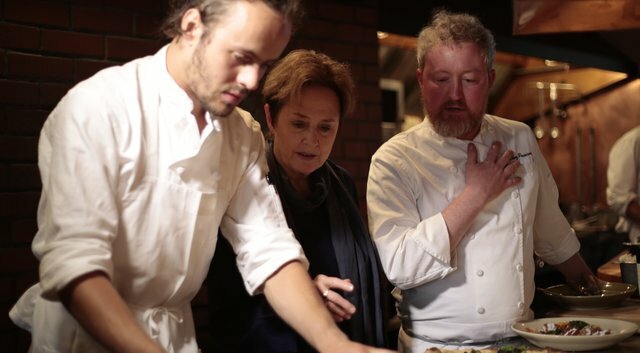 ‘Culinary Journeys’ in September joins American chef and food pioneer Alice Waters (pictured, centre), as she travels through California to discover the state’s finest produce. Known as the mother of slow food, Waters is known for leading a delicious revolution, having dedicated her life to transforming the fast food eating habits of America. Established in 1975, her restaurant ‘Chez Panisse’ remains at the heart of Californian cuisine, serving up simple and seasonal home cooking in the university town of Berkeley. The highlight of the year comes each summer when Chez Panisse plays host to its annual garlic festival – a tribute to a much loved ingredient which falls on the National Day of France, Bastille Day. ‘Culinary Journeys’ accompanies Waters to meet her friend Bob Cannard, a long-time Chez Panisse producer who supplies the garlic for this year’s feast, before travelling to Napa Valley to sample some of the region’s finest wines. Returning to Berkeley, ‘Culinary Journeys’ joins Waters for the Bastille Day celebration: a tribute to the finest local produce alongside friends, musicians and, of course, garlic. For the frugal business traveller, bargain airline fares can seem hard to pin down. In September, ‘CNN Business Traveller’ explores air travel tricks that could help business flyers grab a better fare, a better seat and a better flight experience overall. Host Richard Quest sheds light on what determines the cost of a plane ticket; why certain passengers pay more or less, and the science behind pricing. ‘CNN Business Traveller’ reports that for travellers looking for a better seat, discounted upgrades can be found through several different options, these also include live auctions on mobile apps. Quest speaks to Kevin Stamler, the CEO of one of these new apps, SeatBoost, which allows passengers to bid for first class seats on flights. Quest tests out what it’s like to be a bidder in a live auction. ‘CNN Business Traveller’ also visits a weekend boot camp in Washington D.C, where flyers are learning the secrets of playing the points game. Quest meets travel blogger Alex Bachuwa, the man behind ‘The Points of Life’ to discover what travellers are doing wrong when they redeem their rewards. The usual length of time an astronaut spends on board the International Space Station is six months. In that time the astronauts on board are constantly tested both mentally and physically. In September, ‘Vital Signs with Dr. Sanjay Gupta’ profiles Scott Kelly (pictured, left), a former astronaut who spent nearly an entire year on board the station. With deep space travel to Mars – and beyond – being the ultimate goal, Kelly’s historic mission was the first step in determining if the human body can withstand the harsh environment of space for that long. As ‘Vital Signs’ discovers, the mission doesn’t end there. Scott Kelly is an identical twin, so NASA is also studying his twin-brother Mark (pictured, right), back on Earth. The answers from this study could change the future of space travel. Gupta sits down with both Kelly brothers for their first television interview since Scott’s return, and find out what this year in space mission could mean for the future of space travel. In September, ‘Open Court’ looks back on a summer to remember across all aspects of the sport. ‘Open Court’ host Pat Cash (pictured, right) speaks to this year’s US Open Champions, Angelique Kerber (pictured, left) and Stan Wawrinka. Following her victory at Flushing Meadows, Kerber replaced Williams at number one in the rankings, and she speaks to Cash in Central Park the day after the second of her Grand Slam wins this year. After winning Wimbledon and defending his Olympic gold medal, ‘Open Court’ also reflects on Andy Murray’s successful year and consider the possibility of overtaking Novak Djokovic to become world number one. ‘Open Court’ meets fellow gold-medallist, Monica Puig in Puerto Rico. Puig beat two grand slam champions to claim the title in Rio, and she reveals what it means to have won the country’s first-ever gold medal. In New York, Cash travels to the former home of the US Open, Forest Hills. As the venue welcomes back competitive tennis, Cash meets members of the New York Empire team, who play their home matches at Forest Hills as part of the World Tennis Season. Cash speaks to captain Patrick McEnroe and the team’s star player Christina McHale, as ‘Open Court’ explores the historical past and the bright future of the iconic venue. This month, ‘Make Create Innovate’ examines the world’s data usage and the innovations that are shaping its future. Every day the world produces 2.5 quintillion bytes of data, which equates to a stack of Blu-Ray discs that would reach four times higher than the Eiffel Tower. Increasingly the classic large server rooms used are no longer viable, and the race is on to find a way to store more data in less space. ‘Make Create Innovate’ reports from Cambridge, United Kingdom, examining how a European-wide group of scientists are using synthetic DNA to store data. The potential for this project is enormous, to the extent that all the world’s digital information could fit in a shoebox. ‘Make Create Innovate’ also reports from the city of Southampton, United Kingdom, meeting a group of scientists who have developed a way to transfer information into glass in a five-dimensional shape. These tiny silvers of glass could store 360,000 GB for billions of years. In September, ‘Winning Post’ goes behind-the-scenes and takes an in depth look at the daily life of a jockey. There are currently around 450 jockeys currently licensed in the United Kingdom and what they do has been described as “one of the most dangerous jobs on land”. ‘Winning Post’ host Aly Vance spends time with one of Ireland’s finest, Chris Hayes (pictured), and finds out exactly how he spends his time, from his gruelling daily training regime, his extensive physio treatments, and what he does to relax. Speaking to Hayes’ family and friends, Vance discovers the highs and lows of this demanding and often risky career choice, and what drives a jockey to succeed in such a competitive industry. Following the much-publicised recent death of amateur jockey John Thomas McNamara, the dangers associated with the sport are in the media spotlight. ‘Winning Post’ meets Irish jockey Niall McCullagh, who himself sustained serious injuries in a fall whilst on the gallops in 2015. McCullagh talks to Vance about his path to recovery, highlighting the risks jockeys take every day, and the possible repercussions. Come race day, it’s all about winning. ‘Winning Post’ returns to meet Chris Hayes and experience the excitement and pressure as he prepares for the prestigious QIPCO Irish Champion Stakes.